And consumers have reached a breaking point. The government’s statistics agency IBGE reported today that its narrower measure of retail sales, which excludes cars and building materials, dropped 4.9% year-over year in December, “frustrating hopes that end-year markdowns would boost demand for electronics and home appliances,” as Reuters put it. In all of 2016, this narrow measure of retail sales dropped 6.2%, the worst decline in the IBGE’s data series going back to 2001. A broader measure of retail sales, which includes cars and building materials, plunged 8.7% in 2016, according to IBGE. This is in part due to the steady collapse of vehicle sales. In January, total vehicle sales dropped to 121,400 vehicles, the lowest in over a decade. 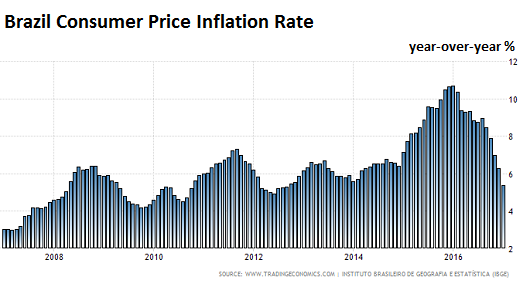 Despite the sharp economic decline over the past two years in Brazil, consumer price inflation has been red-hot, ranging mostly above 6% year-over-year, and peaking in the double-digits at the end of 2015 and early 2016. As far as inflation is concerned: no demand, no problem. That combination of high inflation and economic decline is an all too common occurrence and a devastating one because it destroys the purchasing power of consumers (workers), who, with surging unemployment, cannot demand wage increases to compensate them adequately for the loss of purchasing power. Hence the collapse in real wages – of the lucky ones who still have jobs – and the collapse in the standard of living. And hence, the collapse of consumption and more narrowly, the collapse of retail sales. Inflation – and it doesn’t have to be hyperinflation – can be vicious for workers, consumers, and creditors (though it’s the best thing since sliced bread for heavy debtors). This connection between inflation and consumption in a declining economy with high unemployment is something inflation-mongers in the US should keep in mind. – It’s similar to what happened/happens in Britain right now. Keep an eye on that country as well. – I think A LOT OF (US) “investors” will get hurt. They played the “Reach for Yield” game with brazilian bonds. In the US the 10 year yield is at ~ 2% while the brazilian 10 year yield was (past tense) at say 7 to 8%. A brazilian company could lower its interest costs form say 8% down to say 4% when that company borrowed in USD instead of in BRL. And US investors were very eager to gobble up that 2% extra yield. – But now that the BRL has lost value against the USD those brazilian companies are in deep do-do. See reply to Cybil for scientific explanation. Yeah. I moved the word around and the R fell out when I did. It just fell right out of it. That’s why it is correct in the URL, and in the email update I sent out, and in the tweet. I never thought an R could just fall out of a word like that. But I swear it did. Rs are a slippery letter and will quickly jump out of your words. However, if you keep an eye on your Ps and Qs, the Rs will stay in line. 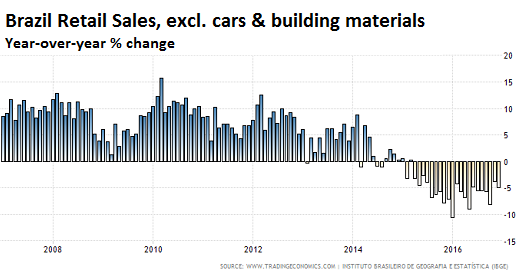 So what is driving inflation in Brasil, USD exchange? Are they heavily dependent on imports for consumer goods? Wolf, I’ve always challenged the notion that inflation was a good and necessary in my own mind when I hear these central bankers and economists talk about the necessity of it. Where does this come from? Is it simply these people mistaking something that is symptomatic of demand and growth, for a prerequisite of growth? 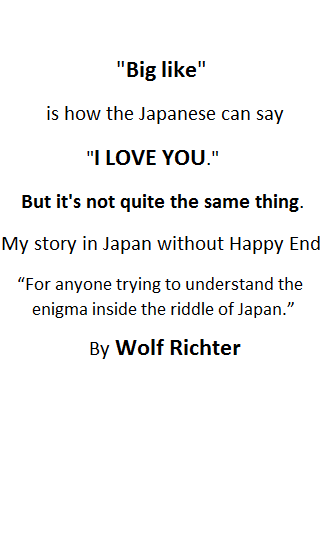 It seems rather absurd to me. As I understand it the inflation has the effect of deflating debts making us all able to borrow more and more and more thereby keeping the fiat currency, US petro dollar ponzi scheme going. If the inflation stops, repaying the debt is harder. If we go into deflation we may not pay our debts at all and the whole illusion evaporates. Looks like the beginning of 2016 was an inflection point. I remember the interest rate at that time hit 12%. EWZ was a buy about 1 year ago. What really hurt Brazil….besides the political corruption was the drop in commodities…..oil, suger, coffee. Oil is now up 100% from the lows around 2016 and so is surgar. Coffee is up about 50%. From Belem, Brazil. Commercial rentals as storefronts and industrial parks started losing renters and putting up signs “For sale or rent” late in 2015. Now residential real estate has followed. People are giving up their rented houses and moving in with relatives. Malls are losing renters. I know guys who having been looking for jobs for over a year. But I hear that jobs are available in Rio.